I’ve been very pleased that my six-year-old daughter has taken an interest in collecting coins. She is always eager to rifle through change looking for special coins – as does her father! 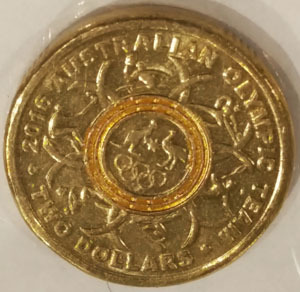 This evening I gave her an Australian $2 coin from the 2016 Australian Olympic Team series. 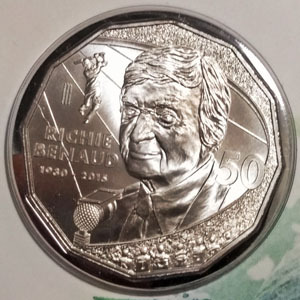 To avoid a fight, I gave her four-year-old sister a 2000 Royal Visit 50c piece (km #437) both of which I got in change. I was very disappointed later to find them throwing the coins around. It got me thinking though, about the history of tossing coins. Many accounts refer to the Ancient Romans, who called the practice “navia aut caput (“ship or head”). Bellevue rare coins notes that the game possibly began in Ancient Greece “where boys covered one side of a shell with black pitch and left the other side white before flipping it in the air”. I’ll leave the history of shell tossing to the conchologists in the audience and start with the Romans. Unfortunately, I’m no more an expert on ancient Roman coins than shells. I’ve tried to summarise the main points of interest and note references in the text. The Ancient Eu site notes that the early Roman republic used a system of bronze weights as a monetary unit. One unit was equivalent of 324g or 11 ½ oz weight. These were produced up to 218 Bc. The first Roman coins as we know them were produced around 326 Bc. 1 Aureus then, equalled 400 Asses. Although inflation meant a loss in buying power, the Littleton Coin company advise that “during the time of the Roman Republic, you could buy a loaf of bread for ½ As or a liter of wine for one As. A year's pay for a commander in the Roman army around 133 B.c. was 10-2/3 Asses, by Augustus' rule (27 B.c.-a.d. 14) 74 Denarii, and by the reign of Septimus Severus (a.d. 193-211), it rose to 1,500 Denarii”. So, back to ships and heads on coins. The “forum Ancient Coins” site has an article on the Roman practice of putting ships on their coins, noting that at least the as, semis, denarius, antoninianus, quinarius and follis received such decoration at various times. Trusted Coins also has some details on both Roman and Greek coins of the late Bc era featuring ships and how many of the early Roman coins were based on Greek coins of the time. After Britannia (largely England and Wales) left the Roman empire in the 5th century, local currency production largely ceased until the 630s. Many English coins, as far back as at least the 7th century, had a cross on one side. Numista has numerous examples of Thrymsa, Sceat, Styca and Penny from the 7th and 8th centuries from various parts of England which depict crosses. Several sources note medieval English use of the term “cross and pile” for the practice of tossing coins to decide something. The term “pile” possibly comes from the device used to strike coins. Brewer’s dictionary offers several alternate explanations for the term, both French. One explanation is that ancient French coins depicted a column, called a pile (from which the word “pillar” is derived). The Ancient resource website has a good picture of a pillar on a feudal French coin. The other explanation Brewer offers is of French coins depicting a ship called a “pile”, the origin of the word “pilot”. I haven’t found as many references to medieval or feudal French coins bearing ships, but perhaps early French coins could be a future article subject for someone more knowledgeable than I.
Peru gets a mention in a couple of places for coin tossing, where the practice is still called cara o sello (“face or seal”). The first coins in Peru came with the Spanish conquerors in 1532 Ad. 36 years later, the Lima mint started operating. The first coins from the Lima mint were known as Rincones, after their Ensayador (the official in charge of certifying the weight and fineness of coins), Alonso de Rincón. This design featured the Coat of arms of Castile and León with crowned pillars over waves on the reverse. As interesting as Peru’s early colonial “cob” coinage is, I had to browse forward through Numista’s entries to the reign of Fernando Vi of Spain before we find a “head” on Peruvian coins, and then only on gold Escudos from 1751 (km #56). By 1772 and the reign of Carlos Iii we finally get a more “common” coin (the ½ Real, Km #74), with the head of the monarch on one side and a “seal” (the crowned arms and pillars) on the other. Current Peruvian coins do still have the coat of arms on the obverse, though now the current Peruvian coat of arms is used. On the reverse, they have the value and several designs, none of which is currently a face. Many sports use a coin toss, often prior to play, with the winner getting a choice over an element such as which end they will start from or face. Often specially minted ceremonial coins are used for this purpose. The coin toss has been used for matters with more at stake. In the United States, two men both had a claim to the land now known as Portland, Oregon. Both wanted to name it after their own hometown (boston, Massachusetts and Portland, Maine), so they tossed a coin for it. The coin in question was an 1835 “matron head” penny (km #45.1), minted in Philadelphia which is now on display at the Oregon Historical Society. In 1903 the Wright brothers tossed a coin to see who would take the first ever powered flight. Wilbur won, however his flight was only partially successful. Orville’s later flight is widely considered the first example of powered flight. I can’t find a reference to the specific coin used there, but if it was also a penny, then by then it would likely have been an Indian head penny (km #90a). Australian diggers (soldiers) took coin tossing one step further, by adding a second coin, calling it “two-up” and betting on the result. Though played earlier (possibly brought to Australia from England with the First Fleet), it is now closely associated with Australian Soldiers. In Australia, the game is still legal only on Anzac day. So, the history of throwing coins in the air goes back long before my cheeky daughters.